QMy name is Missy. I am 11 years old. I want to get a rat. Actually I want to get two females to keep each other company. I have a question, on www.petsmart.com they said rats SHOULD be in a wire cage, but in the info you sent me last time it said rats SHOULDN’T be kept in a wire cage. Which is true? A 950 Fern cage with 3 shelves and cat pan bottom. ARats are okay in a wire cage as long as the floor is not wire. Wire flooring can damage their feet and cause a condition called Bumble Foot that is a severe swelling of the foot and very painful to the animal. On the cages with shelves, the shelves themselves should not be wire but the ramps that connect them can be wire as long as it is SMALLER than 1 inch by ½ inch. One inch by ½ inch is the perfect size for a rat’s hind leg to get stuck in and get broken, so you never want to use that as a ladder or flooring. That size is okay for the cage itself as the rat does not step on it the same way as when it is climbing straight up. There are cages with plastic “cat pan” bottoms which are good (were made by Fern Mfg. that is no longer in business). There are also cages with metal bottoms (Ware manufacturing makes some and Martin's Cages is another company) that work well except if it gets cold where the rat is going to be, then remember that the metal will be very cold as well and not such a good choice. 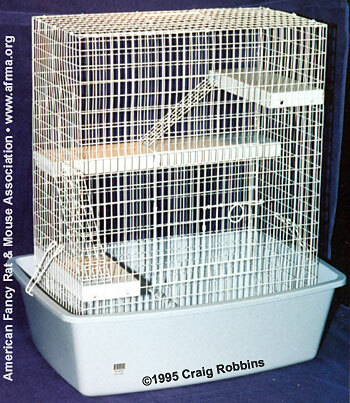 If it is a cage with a pull out tray, then make sure that the space is too small for the rat to get out if it should push the tray out. Cages that are built for rabbits or guinea pigs are usually not suitable for rats as the rats can wiggle out from between the spaces in the wires or get their head caught and strangle.